Posable wooden figure. 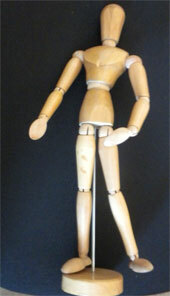 This jointed mannequin can be used for artists renderings. It has endless posing possibilities and is in very nice condition. Measures approximately 13" high and the mannequin itself measures 12" high. Only 10.95 plus Free Shipping!